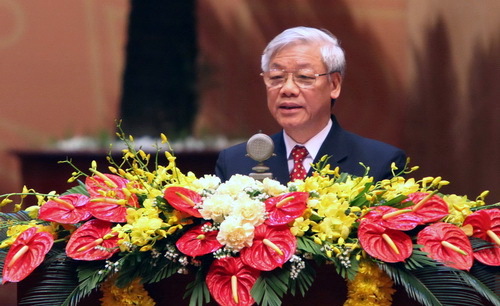 The security forces of Vietnam and Laos should step up their mutual assistance and cooperation to strengthen social order and security in each country, said General Secretary of the Communist Party of Vietnam Nguyen Phu Trong. Party leader Trong made the statement while receiving a delegation from the Lao Ministry of Public Security, led by Minister Thongbanh Sengaphone, in Hanoi on Friday. The Party chief applauded the visit by the delegation and congratulated them on the achievements made by the Lao people in various fields in recent years. The leader highly valued contributions of the two security forces to the development of the special relationship between Vietnam and Laos, and urged the two sides to effectively implement the agreements signed between the two countries. For his part, Minister Thongbanh Sengaphone briefed the host on the Lao situation and informed him about the achievement of cooperation between the Lao and Vietnamese Ministries of Public Security and the results of the talks between the two ministries. The minister affirmed to work closely with the Vietnamese side to implement the signed agreements effectively. He also thanked Vietnam for its assistance and support over the years and congratulated Vietnam on its remarkable achievements in internal and external relations.